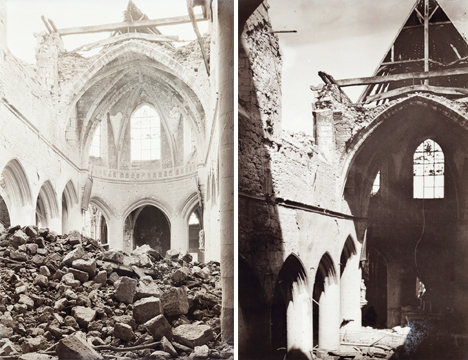 Seen from the eyes of a German officer, these dramatic photos depict the St. Quentin Cathedral in northern France, which was almost completely destroyed during World War I. They’re part of a collection of over a thousand photos, stereographs and negatives saved by Lt. Walter Koessler’s family and shared by his grandson on Tumblr and in a forthcoming Kickstarter-funded book. 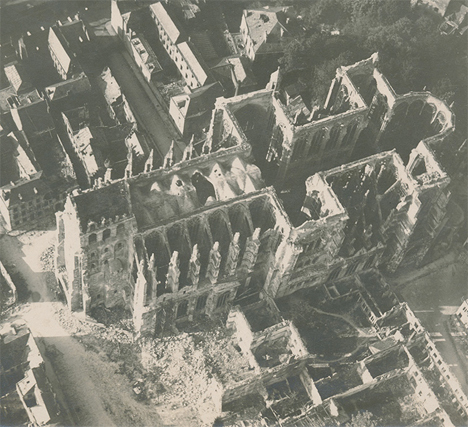 The church was constructed over a period of nearly two hundred years, starting in the 12th century, and survived damage from both fire and invaders’ artillery several times prior to World War I. 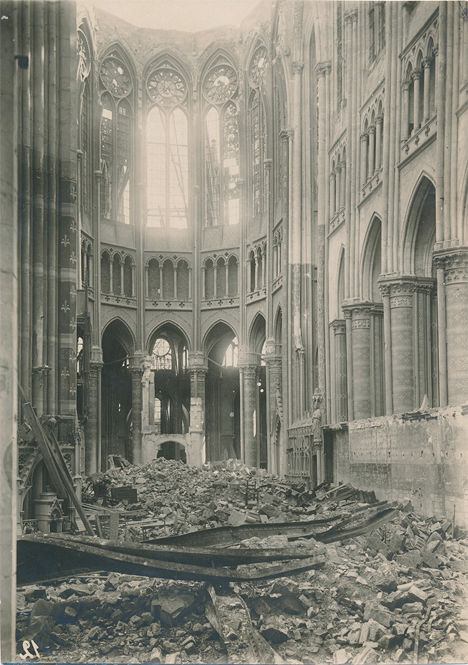 In 1916, a bomb dropped nearby blew out many of its stained glass windows, and in 1917, a fire destroyed everything within its walls, causing the vaulting of the central nave to collapse, and destroying parts of the flying buttresses. 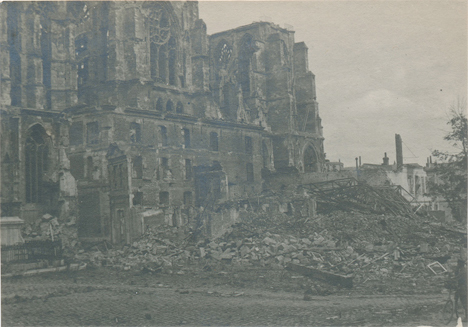 In 1918, the Germans almost succeeded in blowing the whole thing to dust. 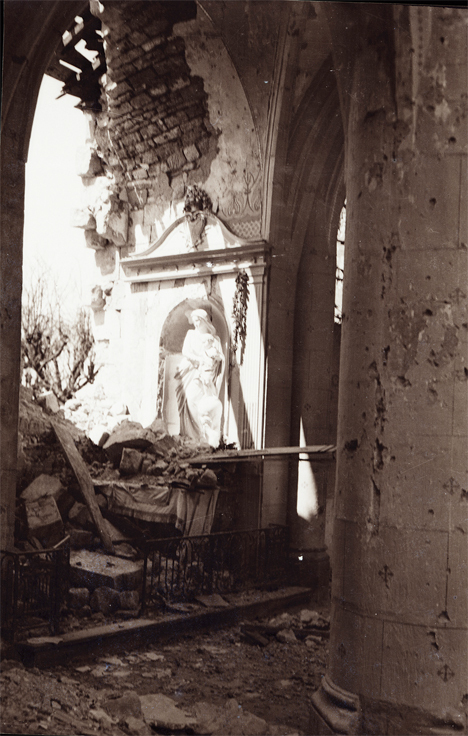 Having chased out the occupiers, French soldiers entered the cathedral to find that ninety-three holes had been drilled in the walls and pillars and filled with explosives. A German engineer captain was left behind to finish off the task, and stopped just in time. The church has since been restored. 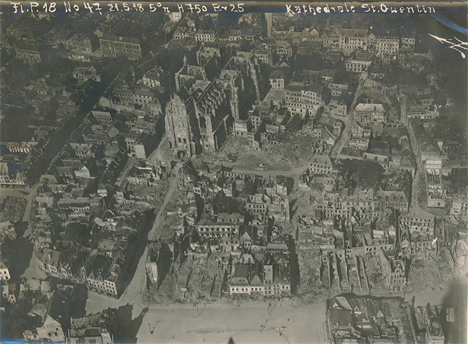 Koessler’s photos offer a unique glimpse not only into the German side of the war (as Putney points out, most surviving photos were taken by the Allies) but the personal viewpoint of a photographer who had been trained as an architect. See the whole series at the Walter Koessler Project.